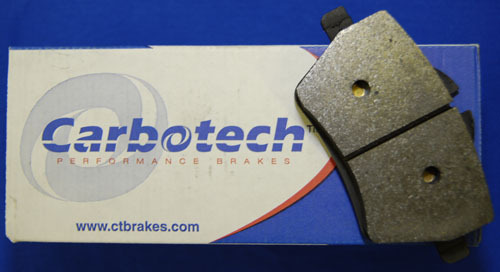 Carbotech Brake Pads Carbotech brakes utilize a ceramic and metallic construction in a range of compounds that out-perform competitive brakes. Carbotech brakes are made from compounds that offer higher initial bite, torque and fade resistance—providing consistent brake modulation and performance over a wide range of operating temperatures. In addition, Carbotech brakes are rotor friendly, saving money and keeping your vehicle out of the service shop far longer than the competition. These pads are SUPER low dust. And come in a large variety of compounds from Street, autoX, light track, track, FULL Race and a few in between. Fade free monster braking force!!!! Ran then at Homestead, Sebring all could not defeat these pads!